Like every engineering student, when I took admission in engineering college I had high hopes and ambitions of doing something big and worthy. But the monotonous curriculum, seniority dogma, student-faculty gap never provided conducive environment for research and those high ambitions somehow faded away. Engineering seemed to be limited to only what was there in textbooks. However when I finished my summer internship this year (2017) at Precog, I suddenly experienced a revival of my engineering ambitions. People around were working and building stuffs that are being applied to solve real world problems and being one of them was like dream come true! My stay at precog was the most enriching part of my academic life. My project supervisor, Prof Ponnurangam Kumaraguru (PK) is the most awesome teacher I ever had. My journey with Prof. PK virtually began in fall 2016, when I took up his online course Privacy & Security in Online Social Media on NPTEL. I was looking for domains where I could apply my knowledge of computer science to solve real world problems, when I stumbled upon this course. Back then I was in 3rd year of my BTech study and was aiming for a summer internship at some premier research centers during my forthcoming summer vacation. 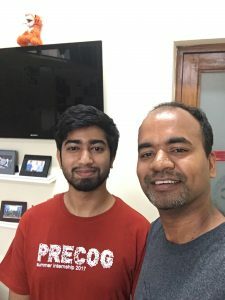 Few weeks into the NPTEL course, I was so fascinated by the course contents and teaching of PK, I absolutely made up my mind to do internship under him. Some time after the course had ended, I mailed PK with my SoP and CV, explaining why I wish to work at precog and how my interests and previous works align with the research domains pursued at precog. Few days later, I got a mail from him and after 3 rigorous rounds of selection process, I finally got selected for my much coveted internship. My project at precog was on Information Overloading with Niharika Sachdeva as my mentor and guide. I primarily worked to figure out how the frequency of posting affects the engagement on posts made by police pages/handles on Facebook and twitter. Will write a separate blog on my technical work. Getting a conclusion from the large dataset was however not easy and took me weeks of failed analytics and experimenting with different statistical measures on the data. The best thing about precog is that it pushes you to your limits. I used to spend most of the time in the lab, highest being 18 hours. Lab hours never got boring, as I was always surrounded by hardworking and awesome people round the clock. People around were always ready to provide helping hand, be it professional or personal. My most favorite thing at precog used to be WhatsUps (regular meetups held twice a week) as it facilitated interaction with everyone, including PK, and also getting to know each other’s work. It thrilled listening to exciting work going around. 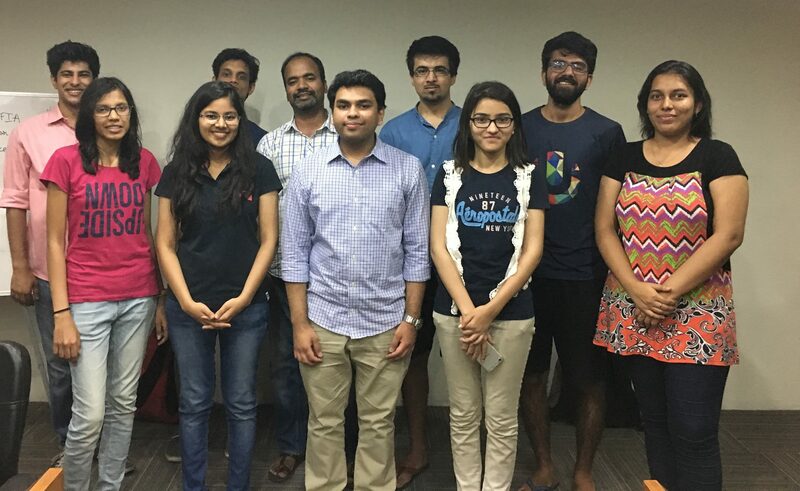 Then there were detailed discussion sessions known as #DeepDive (a nightmare for me though :p) where one has to elaborately explain their work, codes, hypothesis, observations etc. I used to be highly concerned about DeepDives as I had to be prepared for most unanticipated questions and criticisms. The suggestions, criticisms and feedback however helped me a lot in refining the work done and coming up with better results. Here everyone was keen to help whenever I got stuck in something. IIIT Delhi also had some surprises for me, that were to break my prejudices I had about educational institutions. I belong to a government engineering college; and being from a government college I am not used to niceness of professors and research scholars. I am used to professional barrier between students & teachers and undergrads & scholars. But starting from my day 1, I was extremely surprised how people were at precog. There is absolutely no professional protocol existing, like addressing research scholars as sir/madam, following a strict formal conversation style with them etc etc. These were something I was never used to, and it took me some weeks to get adjusted to. Everyone is friendly irrespective of them being PhD scholars, MTech scholars or RA’s. We cracked jokes, played games, went out for lunch. The person who made the most difference is PK himself. He is the most wonderful and friendly teacher I ever met and is completely different from conventional teachers. He invited us for dinner at his place, watched movie with us, took part in fun games; somethings hardly any professor does these days. 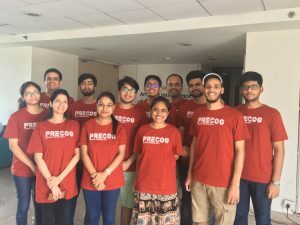 He emphasizes on “Work hard, play harder”, thus apart from work related stuffs, he organizes fun gatherings and outings (we call it precog social). My best memory with him is this selfie. Its the first time I ever had a selfie with a professor!! Being in Precog was much like being a part of a big family. It feels great being in such a group of highly talented and knowledged people working on really cool stuff that are making a difference in how online social media is used. I am super delighted to have worked with these awesome people. Can’t have a summer better than this!!! Here’s the glimpse of precog family of which I was a part of.